New York Times bestselling author Kyra Davis stops by to talk about her love-to-hate/love interest in Deceptive Innocence as well as Alpha Males and the difference between desire born from anger and desire born from need. 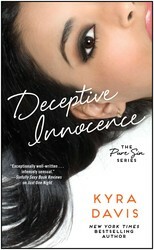 Deceptive Innocence is available today! I don’t know why romances that begin with antagonism are so delicious. Perhaps we should blame Gone with the Wind for getting us addicted to these impossibly hot I-can’t-stand-him-but-I-have-to-have-him love stories. I played with that theme in my Sophie Katz mysteries in order to build sexual chemistry between my protagonist and her love-to-hate/love-interest, and now I’m back to it with Deceptive Innocence. That said, I did put a different spin on it this time. In this book a young woman who goes by the pseudonym Bell Dantès, has a score to settle. Her mother was set up for a murder she didn’t commit by the powerful Gable family after working for them as a maid. Bell was ten when her mother was arrested, and a homeless teen when her mother died in prison. Now Bell has grown into a beautiful, self-educated, goal oriented young woman. Her biggest goal? To make the Gables pay. She still has the antagonism I love so much, but she has to mask it in order to achieve her objective—and in doing so she finds that this anger she’s clung to for so long is being overpowered by a very different emotion. All this brings me to another element I’ve come to love in literary romances: Alpha Males (capital A and capital M intentional). Lander definitely falls into that category. But for me, Alpha Males are only interesting if they’re with Alpha Women. In Deceptive Innocence I was able to have both. There is no doubt that Bell is the predator in this story. She’s literally a huntress. But in order to maintain the upper hand she has to submit to Lander, sexually. Once again, what’s difficult for her is not that she’s doing this, but that she’s enjoying it so very much. How much does Lander know? As I noted, he’s more perceptive than the rest of his family and if he’s figured out who she really is, then it’s possible that he’s the one playing her. It’s a game of cat and mouse in which it’s rather unclear who the cat is. But all that said, at its core, Deceptive Innocence is about how we must differentiate the desire that is born from anger and hurt from the desire that is born from need. Growing up alone, without any family or friends to speak of there are things that Bell needs. But does she need revenge? Justice? Love? Oris there a way for Bell to have it all? Is that something she even has a right to strive for? I really hope you enjoy Deceptive Innocence as much as I enjoyed writing it. It’s got angst, passion, loss, rage, love and even a little mystery thrown in to keep you on your toes. Because while Bell may be conflicted I’m very clear: I do want my readers to have it all. Thriller scribe Sophie Katz is as hard-boiled as a woman who drinks Grande Caramel Brownie Frappuccinos can be. So Sophie knows it's not paranoia or post-divorce, living-alone-again jitters when she becomes convinced that a crazed reader is sneaking into her apartment to reenact scenes from her books. The police, however, can't tell a good plot from an unmarked grave.